Here is a guide to understanding how the proposed business tax in Seattle ignited a response from Amazon unlike the city has seen before. This is how an idea by a handful of Seattle City Council members evolved to eventually roil one of the world’s largest online retailers, Amazon. 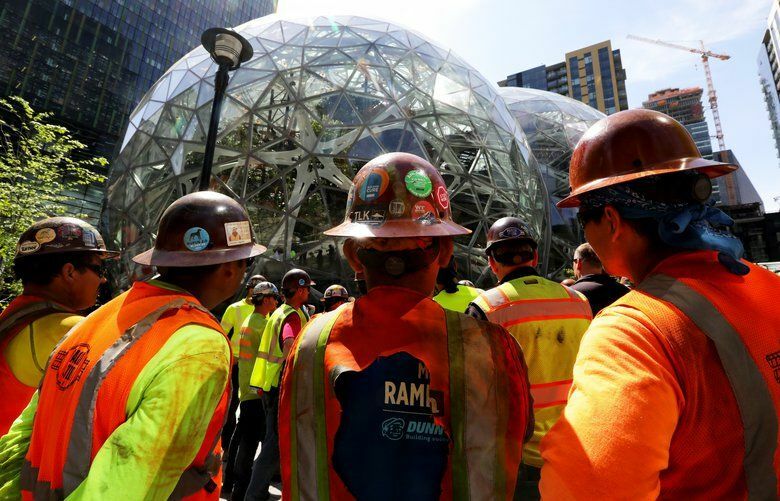 Over months, The Seattle Times has reported on the so-called “head tax” proposal and what people are saying about it, from early discussions at City Hall to residents’ complaints to protest lines at the Amazon Spheres Thursday. Here’s a look back on that coverage to explain how the company and city reached this point. What is the head-tax proposal? Pending City Council approval, the ordinance would apply to all businesses grossing at least $20 million per year in Seattle beginning next year. They would have to pay 26 cents per Seattle employee-hour. 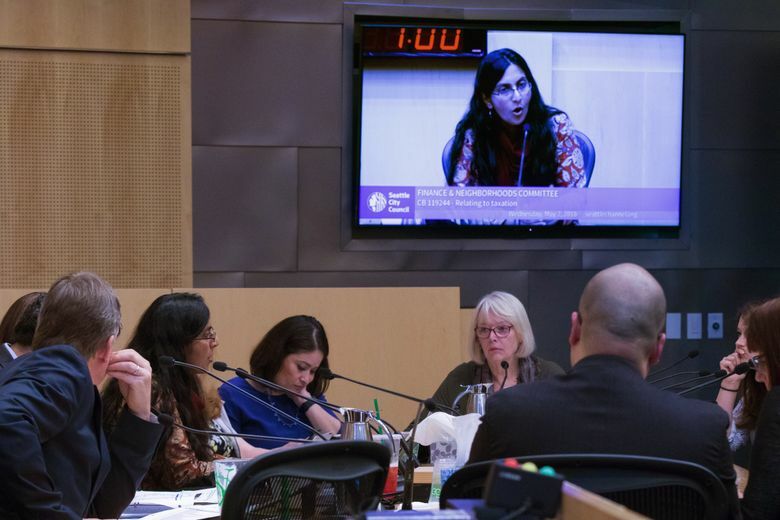 Five of the council’s nine members support the idea (M. Lorena González, Lisa Herbold, Teresa Mosqueda, Mike O’Brien and Kshama Sawant), estimating the new tax to affect 500 to 600 companies citywide, each paying about $500 per employee. That would raise an estimated $75 million for the city annually, they say. According to supporters, the new tax is way to make big employers fork over money to help ease the city’s housing affordability crisis, due in theory to their high-wage employers and development increasing rents and home prices. But opponents, such as the Seattle Metropolitan Chamber of Commerce, which counts Amazon as a member, describe it as a “tax on jobs” and have said companies are paying their fair share. “The current reality on the streets of Seattle clearly shows the City Council’s approach to the biggest crisis facing our region has been inconsistent and ineffective,” said the Seattle Metropolitan Chamber of Commerce, in a statement last month. Also, some small-business owners are worried it could hurt large companies they do business with, Seattle Mayor Jenny Durkan has said. Under the draft legislation, which council members could change, $50 million would go to affordable housing construction, $20 million to homeless services and $5 million to administrative costs. Supporters of the tax have pointed to an extensive waiting lists for homeless services, but especially for subsidized housing. Emergency shelter beds for single adults were full 90 percent of the time last year, according to data from King County’s All Home. The region’s homeless population has only ticked up in recent years, with nearly 5,500 people living unsheltered in King County during last year’s one-night homeless snapshot. Why this type of tax? Washington state doesn’t tax income or capital gains, leaving Seattle with few new revenue options as its population explodes, the measure’s sponsors said in a joint statement. In similar scenarios to generate new money for the city, the council in recent years has adopted new taxes on gun sales, sugary drinks and wealthy households — seeing the wealthy-households tax struck down in court. In 2016, voters approved a seven-year, $290 million new property-tax levy for affordable housing. What would it mean for Amazon? The tax could cost Amazon — with about 45,000 Seattle workers — more than $20 million per year in 2019 and 2020. In 2021, it would be replaced by a 0.7 percent payroll tax, instead of the employee-hours tax. Under that formula, Amazon’s liability would likely increase to an estimated $39 million, assuming the company had 50,000 Seattle employees then. Amazon announced Wednesday morning it was pausing construction planning on a new tower in Seattle, part of the company’s 10-million-square-foot campus here, until the City Council votes on the new tax proposal. Amazon also may sublease rather than occupy space in a skyscraper under construction downtown, according to a company spokesman. The statement — using the 17-story “Block 18” tower and the skyscraper being built at Rainier Square as political leverage — is a threat of the kind Amazon has never made in Seattle. “I can confirm that pending the outcome of the head-tax vote by City Council, Amazon has paused all construction planning on our Block 18 project in downtown Seattle and is evaluating options to sublease all space in our recently leased Rainier Square building,” the spokesman, Drew Herdener said in a statement. Hours later, an angry crowd of residents and business owners shouted down council members who sponsored the measure at a town hall meeting in Ballard. Many expressed frustration with the city’s handling of the homelessness crisis, particularly the many unauthorized tent camps throughout the city. “To reduce the jobs only increases the possibility of additional homelessness,” said Chris McClain, business manager for Iron Workers Local 86, which represents about 2,600 members and organized the demonstration. The council could vote on the tax as early as this month. The measure needs five votes to pass the council, at which point Durkan would weigh in. Six or more votes from council members would override the mayor’s option of vetoing it. Durkan has said she is concerned about Amazon’s opposition and is weighing what she hears from different constituencies. Seattle Times staff reporters Vianna Davila, Matt Day and Daniel Beekman contributed to this report.